MORRIS GOODWIN SHAPLEIGH was born on 21 May 1837 in Eliot, Maine [Descriptive Roll], a child of Dependence and Jane (Goodwin) Shapleigh. 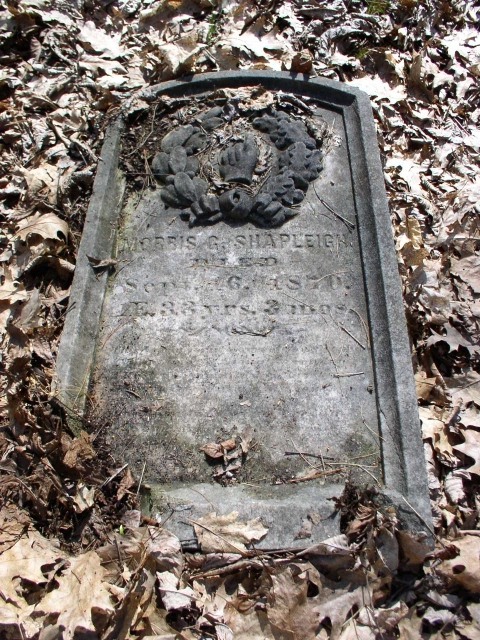 He died on 16 Sep 1870 at age 33 yrs, 3 mos, and was buried in the family plot on State Road in Eliot [YCCI, p698]. He was married on 15 Sep 1863 [Eliot VR cd p158/862; NEHGR v95 p331 has 12 Sep] to ALMIRA LEACH of Eliot. She was probably born in Eliot, ME circa 1841-1842 [age 9 in 1850, 19 in 1860, age 28 in 1870 census, called "Maria"]. She looks to be the "Mira" Shapleigh, widow, who married in Portsmouth, NH, David W Parshley on 15 Mar 1873. She was called Almira when she died in Eliot on 30 Aug 1888, aged 47 yrs, 8 mos [NH vr - record in Portsmouth]. Her burial place is currently unknown. Morris was a house carpenter, and is seen living in Eliot until after the war. With brothers John (who had also served in the 27th Maine), Edwin and Jasper, he moved to Boston, MA, where they all were engaged in the carpentry trade [1870 census]. Shortly after the census was taken, Morris died, but his death was not found in MA VR, so he had perhaps returned to Eliot by then. In Alexander Shapleigh and Some of His Descendants [NEHGR v95 p331], it was said he died without having children, ie "d.s.p. ".